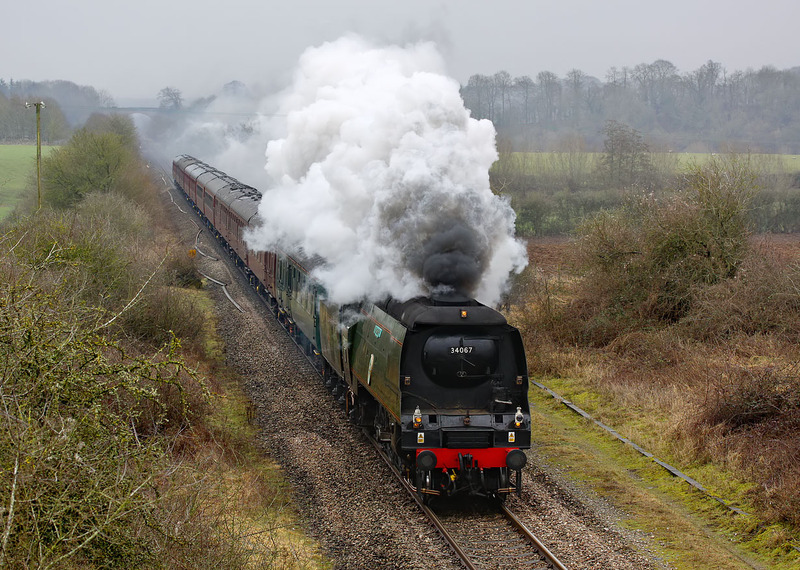 Despite the awful weather, Battle of Britain Class 4-6-2 34067 Tangmere makes a fine sight as it passes Whitehill (between Combe and Finstock) on 9 March 2013 with the Railway Touring Company 1Z71 08:30 Euston to Worcester Shrub Hill 'Cotswold Venturer' railtour. I had chosen this location specifically because it can only be used in cloudy conditions such as this, due to the angle of the line. Also, what little wind there was would not blow the exhaust down over the train, which seems to be a common problem with this locomotive.